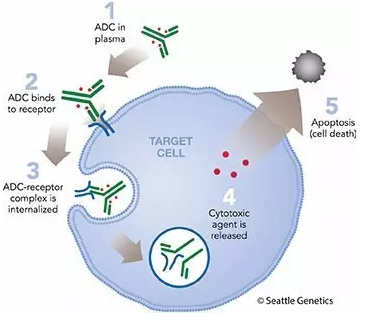 Antibody-Drug Conjugate (ADC) is a new type of biopharmaceutical product that is formed by linking a small molecular drug with potent cell toxicity, to monoclonal antibody. Antibody directs the ADC to target specific cancer cells and the small drugs function to kill the targeted cancer cells. Thus, the ADC has the characteristic of both the specificity of antibody and the toxicity of drugs to precisely remove cancer cells. Combining the advantage of both antibody and small drugs, ADC performs the best quality, reducing the potential damages to the greatest extent. The preparation of ADC is commonly carried out through a two-step reaction: 1. Antibody reacts with a conjugate linker to generate an antibody-linker intermediate; 2. The antibody-linker intermediate reacts with the small drug to form the final Antibody-Drug Conjugate. The two-step reaction is shown in the following graph. Problems that may occur in the antibody-drug conjugation reaction: 1. Due to unknown reasons, some of the antibodies and small molecules may not be successfully conjugated. 2. Multiple numbers of binding sites in the antibody (Cys, Lys, etc. ), may lead to heterogeneity of conjugation site and ratio of conjugation. 3. Due to the hydrophobicity of small molecule drugs, different Drug antibody ratio (DAR) may lead to change of hydrophobicity of the final ADC. As non-coupled small drugs are cytotoxic, these drugs along with free antibodies may affect the efficacy and safety of the ADC. Compared to monoclonal antibodies, the production process of ADCs drugs is more complex, therefore, in order to ensure the safety and effectiveness of the ADC, it is necessary to monitor the quality of the ADC. DAR is an important indicator to evaluate the production process and quality of products. Comprehensive evaluation of the ADC drug structure, DAR, efficacy and safety is critical before the ADC declaration. MtoZ Biolabs has developed an advanced platform for analyzing ADC, with a variety of high-resolution mass spectrometer analysis instruments. Combined with professional bioinformatics analysis team, we can quickly and accurately provide you with professional and systematic ADC analysis and evaluation services. 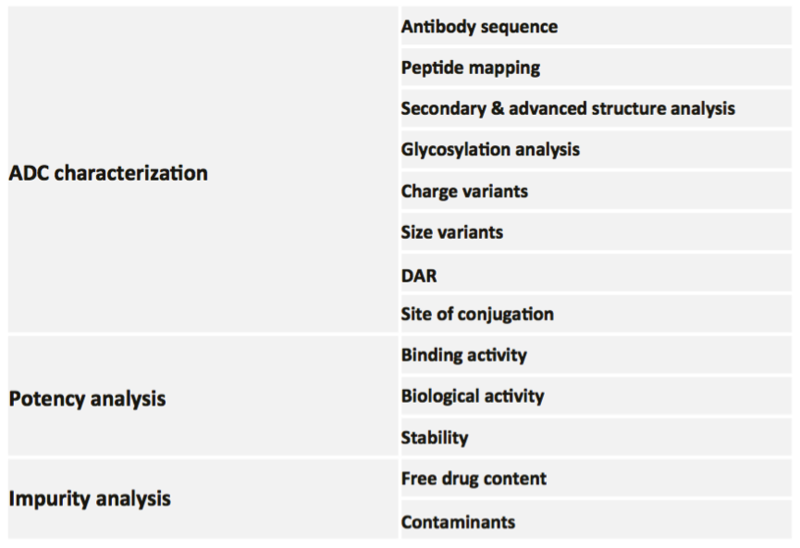 MtoZ Biolabs provides one-stop systematical service to analyze ADC. The service contains three panels, including ADC characterization, potency analysis, and impurity analysis, ensuring systematic evaluation of the drug structure and efficacy of ADC.